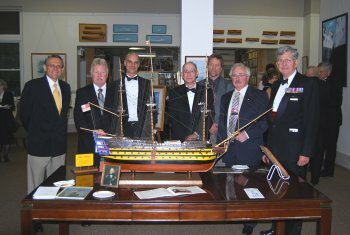 Artists attending the 25th Exhibition - from left to right Stefan Starenkyj, Lloyd Pretty, Peter Rindlisbacher, Ray Warren, Mark Boden, Don Macmillan and John M. Horton. These artists are active within the Society. The Society holds one or more of their works on a permanent basis and is in contact with the artist, or estate, for questions concerning sales, commissions, etc. These artists, or their estates, are no longer in regular communication with the Society; however, it is not the Society's intent nor wish to make them the subject of an exclusion. Artists who have passed away retain permanent honourary membership.